A black comedy that looks formulaic on the surface, but ends up featuring side plot lines rich enough to make it feel unique. The Descendents, like all George Clooney movies from the past few years (well, not including the men who stare at goats), was smart. It was smart both in plot and in personality. It was a movie about a situation that we thought maybe we had seen before, and yet it turned out to be something totally fresh. That’s because it was by no means a one-noted plot with a specific direction, but more of a multi-faceted character in crisis situation. And by crisis I mean numerous life situations all coming into focus at once. On the surface, this looked like a movie about a guy whose wife was in a coma and he finds out she was having an affair. That plot we’ve seen before. This director, Alexander Payne, has only made a small handful of movies, and even he has a movie just like this (About Schmidt, where Jack Nicholson loses his wife and then finds out she was cheating on him.) but in The Descendents, there is so much more going on. Yes, Clooney’s character, Matt King, wants to find the guy who was sleeping with his wife, which is pretty much a staple of movies in this genre (I just saw the dilemma with Vince Vaughn, and similarly he wanted to seek out and confront the guy who was sleeping with his best friend’s girl). 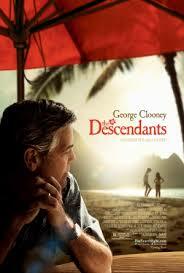 But The Descendants aren’t about one man on his own. It’s about one man and the many other characters that make up his family. That means his daughters, who matt is now forced to take care of on his own. It also means his extended family members who sit with him on a board of ‘descendants’ to some huge land property in Hawaii, and decide whether or not to sell it. This is actually a major plot point of the movie, as king is a bit of a local celebrity because of this inheritance and the speculation about what will be done with the land if he sells it. Will it be turned into a resort or to affordable housing? Or should he not sell it at all and preserve the land the way it is? At the start of the movie, we learn the matt’s wife is in a coma and he takes us through the circumstances involving both her and the land deal through voice over. Clooney has been using voice over a lot in his movies lately and it seems to work for him. It was all over his movie from two years ago, Up In The Air, and it helped make that movie what it was. Similarly, it really helps present the situations to us that are going on here, in the descendants, in almost poetic terms. After we get into this guy’s life a little bit and learn about the land deal, we spend some time with matt and his daughters. First it’s with the younger daughter, Scottie, as he receives a phone call from an angry parent claiming that Scottie is doing awful things to her daughter. Matt takes Scottie over to the house of this parent to apologize to the daughter and we get a scene that is both realistic and humorous. We all know how pointless it is to make kids apologize to each other (it doesn’t actually mean anything unless it comes from them, and not from us making them do it), and yet we make them do it anyway. That’s what this segment basically points out. We spend a little more time with just matt and Scottie as they go to a local restaurant and come across the man who was driving the boat the day when their mom had the accident. I like that this movie doesn’t hide what happened to her and make it into this big scandalous mystery that we only find out about toward the end. Instead, the scene starts out with us learning there’s a reason why Matt doesn’t like this guy, and ends with us finding out what the reason is. And after spending this time with Scottie, it’s time for matt to go get his other daughter, Alexandra, and bring her home. He and Scottie hop on a plane and travel to another one of Hawaii’s islands where Alexandra is away at boarding school. They pick her up, bring her home, and almost immediately after that meet her dopey, teenage boyfriend. Matt tells Alexandra what’s really going on with the mom, and how she won’t be waking up from this, and we follow Alexandra under water in her pool as she deals with the news. It’s a powerful moment. Alexandra lets matt know his wife’s love affair secret and matt gets it into his head to find out more about what was happening. He and his daughters seek out the guy (played by Matthew Lillard), and follow him to a vacation retreat. It becomes a whole little adventure of a subplot, and a lot of fun. Matt gets to snoop around like a spy and he and his kids even do stakeouts. He and Alexandra plot out what they’re going to do, and how they’re going to distract certain people, and it really does feel like they’re planning a big operation. It might be just to get to talk to this guy, but the way they go about it is pretty intense. Meanwhile, the date when a decision has to be made about the land closes in and becomes both a moral issue and also a somewhat symbolic one. Especially when the two situations get tied together and matt learns that there is a connection between his wife’s affair and the possible land deal. Now a whole new layer of complexity has been added to the decision-making problem. 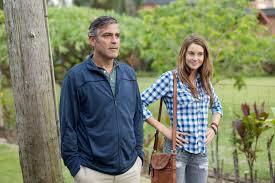 Alexander Payne is an outstanding filmmaker and the descendants are just another success for him. It’s my third favorite of his films after sideways and election, and yet it’s still very good. I like the other movies better because they are both endlessly funny, but this movie is something different. It’s a black comedy with plenty of humorous moments, but it’s also a powerful drama about death and handling it around kids and family. There’s a lot going on here, and the movie really builds up momentum as it goes on, brining in both the man who was having the affair and also his wife, as well as closing in on a climactic scene for the land deal. It’s a more mature film than those other one’s, for Alexander Payne, and it while there’s nothing explosive about it that makes you come away saying the movie was amazing, it is certainly a lot of fun.